At last someone has come to the rescue of all you spankos who want a Cracker Barrel paddle and can’t find one. I?ve found what looks like the famous ?BC Tournament Paddleball? 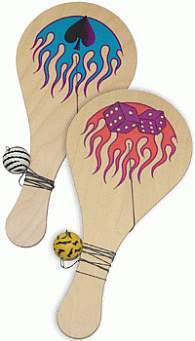 at http://www.whatsnextmfg.com/products/bc/Tournament%20paddleball.htm. *Update* If the link above isn’t working, here’s another one that shows all the paddleballs they have: BC Paddleballs. They also have one called “Blaster” that looks more like it should be called “Blister” if you ask me. I think I’ll order a couple of different ones so Dan and I can check them out. Then I can to report back and let everyone know how the product testing went. No thanks needed; it’s the least I can do for y’all. do they really have paddleball tournaments? I think it’s all a big hoax created so more toys for spankings can be manufactured 😉 but… that’s just me.